The Thurston County Mastodon, MASTODON GRANGERI, sp. nov. The skull and tusks of the Thurston onnty mastodon, found near Pender, have recently been remounted and added to the long list of mastodons, mammoths, and modern elephants to be seen in the cases of Elephant Hall, in the Nebraska State Museum. When found, the skull, teeth, and tusks were encased in Pleistocene gravel, and were in a state of perfect preservation. Contrary to instruc~on, they were pried out of their bed with poles before the wI"::,ter could reach the spot, and the dome of the skull was ruined. The unbroken palate, however, with teeth in place and undamaged, and with parts of the incisive sheaths and the tusks complete and in proper position, was preserved. ,: Unlike typical forms, the tusks are long, slim, almost straight, curving but slightly and spreading but little at the tips. The length of each tusk is about nine feet, and the diameter five inches. These characteristics seem to apply to all mastodon tusks found as yet in this portion of the Great Plains. This does not mean that Mastodon americanus is wanting in Nebraska. To the contrary, numerous teeth and jaws have been found and are preserved in the State Museum, but no skulls with tusks from animals of the forest-loving type are positively known. The Thurston County mastodon seems to represent a Plains type which differs from the ordinary forest type of Mastodon americanus and seems to be a distinct species. We are naming this specimen Mastodon grangeri in recognition of Dr. Walter Granger who has so furthered the cause of vertebrate palaeontology. The specimen was procured for the Morrill Palaeontological Collections of the State Museum, and is numbered 8-9-00. It is believed that several examples are represented in the State Museum. The Boyd County skull, No. 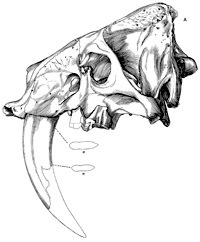 8-8- 23, consisting of the palate with grinders complete, stumps of tusks, and the basi-cranial elements, has been prepared as a panel mount, and is referred to Mastodon grangeri. In this connection must be mentioned the Lancaster County skeleton which was partly exposed by Mr. Arthur Dobson, Class of 1911, which is apparently complete.